First, we have a few images from the early years. I am in debt to Le for hanging onto these photos after he sold the car. Above: Note the white wall tires. Photo Courtesy Le Hodge. Above: Trunk area. Note the wheel wells still B5 blue. Photo Courtesy Le Hodge. Above: Nose with no rub strip. Rims are correct per build sheet. Photo Courtesy Le Hodge. 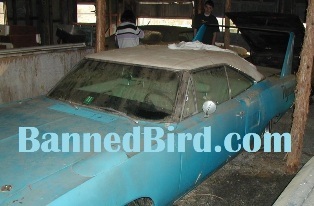 The Superbird has not changed much since these barn find pictures were taken (in 2003 or 2005). At least on the outside! 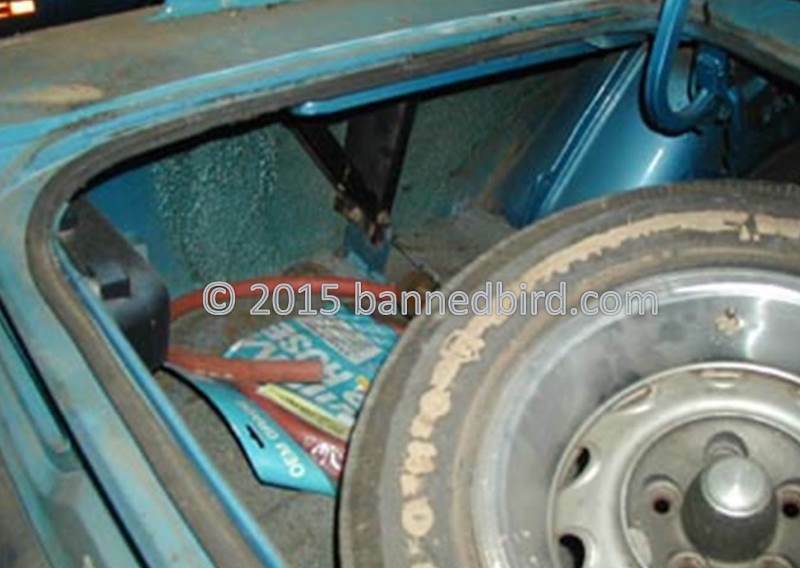 As you can see from the pictures, the center part of the Superbird's rear wing is black. That leads us to believe that something happened to the original center section after the car was repainted to Petty Blue. The white walls would suggest that the owner did not like white letter tires or these were used tires taken off another car. Not unusual in the day is seen in the trunk: a white letter tire that has worn the side wall down to become a white wall! 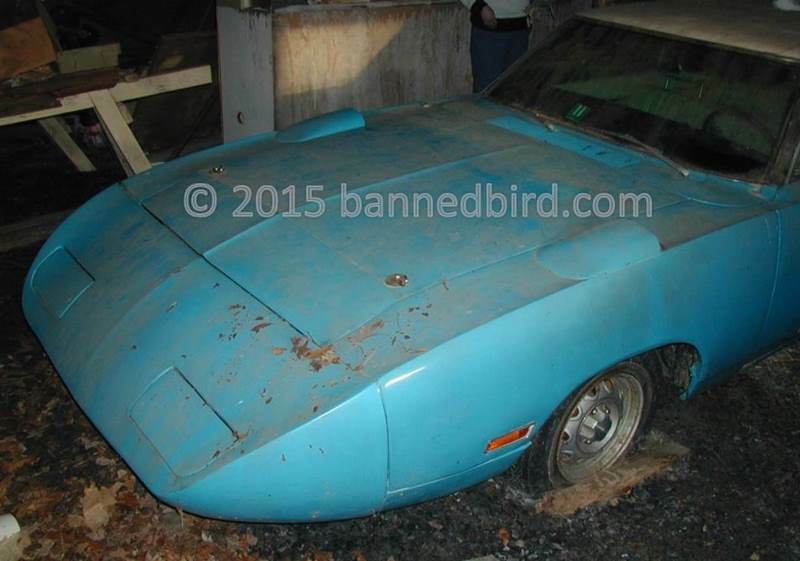 Lack of the Superbird nose's rub strip and headlight decals not unusual: some people preferred the clean look. The white bench seats are seen here. The "NASCAR NO 1" Broadcast Sheet was under the rear seat at this time. 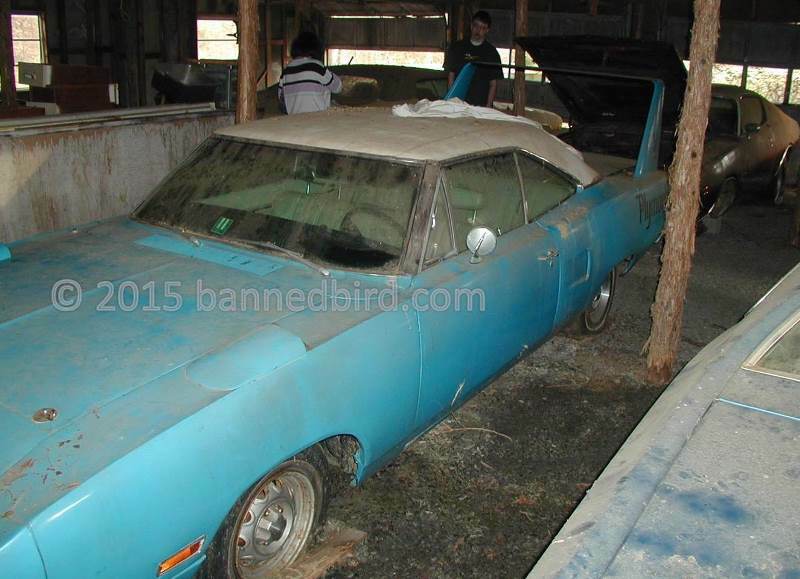 Many Superbirds (and Daytonas and 1969 Charger 500's) had non-matching Broadcast Sheets in them. This was common to black seat cars, since that was the most popular color. Most likely during assembly, the assembly line had several seats staged and ready to go into cars. For the person assembling the car, any black seat would do. The choice of a black "Plymouth" quarter panel decal is unexpected with the white vinyl top. It would have been more likely after repaint to have added a white "Plymouth". Possibly no white decal was available at the local dealer.